Here is a quick fall fruit salad to make that uses the fall harvest fruits-apples and pears. Great recipe to take to a picnic! Mix all together in a bowl. Serve "as is" or drizzle with maple syrup. Have you wondered about the benefits? 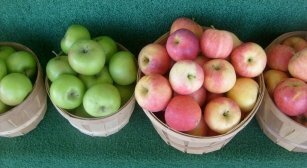 Yes, we have all heard “An apple a day will keep the doctor away.” While it cannot cure EVERYTHING, the truth is that the benefits of apples are exceedingly wide-ranging. So much so, that I heard one health enthusiast proclaim them as "the perfect fruit.” Don't underestimate the humble apple, the benefits for general health are many. And here's a side note: To get the most out of your apple, eat the peel and the seeds. Here are just a few of the ailments that apples can help with memory, allergies and asthma, bone density, cholesterol, diabetes, oral care, and weight loss. While many think that apple seeds are poisonous since they do contain a trace amount of cyanide, they also contain a very helpful nutrient, dubbed Vitamin B17. So the health benefits even continue into the core! Here is an additional note" Apples are the most perfect food to dehydrate. Pre-treat thinly sliced apples in a solution combining fresh lemon, lime or pineapple juice and water, using a 1 part juice to 4 part water rinse. Arrange the apple slices in a single layer on the dehydrator trays. The apples are dry when you cannot squeeze out any moisture. For best storage of your dried apples, pack them in plastic freezer bags and keep them in your freezer. So eat your apple a day, and reap the benefits of this great food!